Are we learning to love BT again? Last week brought great news for BT as they announced a pre-tax profit of £3.17billion, up 12% from the 12 months to March. These are heady times for the company, with exciting ventures on several fronts. A £12.5billion takeover deal for EE is in the pipeline, as BT makes its return to the mobile market. This is one of the steps it is taking in becoming a unified mobile operator. The deal goes before competition regulators this week following protests from rivals about market share. Figures show there is currently a record number of BT broadband customers. A renewed deal to broadcast Premier League football has also been achieved, as BT looks to further challenge Sky’s hold over the industry. So how has this affected public perception of the brand? Well, YouGov BrandIndex data shows an upturn in a number of metrics. 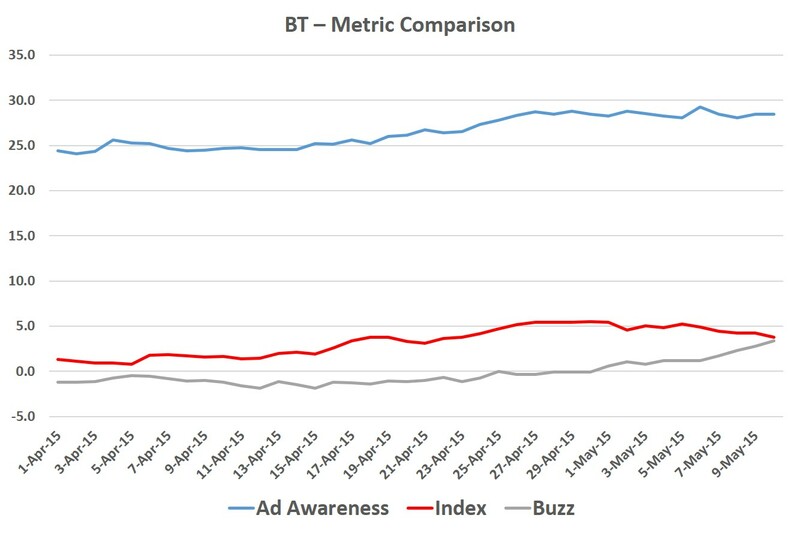 BT’s buzz metric displays a positive rating for the first time in months, with a current score of +3.5. YouGov’s Index metric, which is made up of rankings such as value, quality, satisfaction and recommend also shows a rise over the last month. BT’s score has risen almost 5 points over the last month, reaching a high point of +5 in the last week. The developments intertwine with BT’s new advertising campaign lead by acting star Ewan McGregor. The promotion parodies the process of making an advert and is the first of BT’s ‘behind the scenes’ series. Launched towards the end of April, it is already gaining traction with viewers according to BrandIndex. BT’s Ad Awareness score, which measures whether a respondent has seen or heard an advert from a particular brand in the last two weeks, indicates a steady growth since mid-April. Our data shows an increase from +24 at the start of the month, to +29 at the middle of this one. How BT incorporate EE’s brand remains to be seen, but will be crucial to their ongoing strategy. Analysts see the emergence of a ‘’quad play’’ approach, with the bundling together of packages including mobile and fixed line services together with broadband and TV platforms. Whether BT embrace this will be central to their future success.